Earlier this year, Amazon asked me if I'd like to test its new Echo Look, "the first artificially intelligent style assistant with Alexa," as the retail giant calls it. (As a reminder, Alexa is Amazon's virtual assistant, which is used in the Echo and Echo Dot.) I jumped at the chance to be one of the first to try the innovative device but will admit to feeling slightly intimidated when it actually arrived. (Full disclosure: This is not a sponsored post.) I assumed that the Echo Look would be complicated to set up and use (my initial reaction to most electronics), but I was wrong. 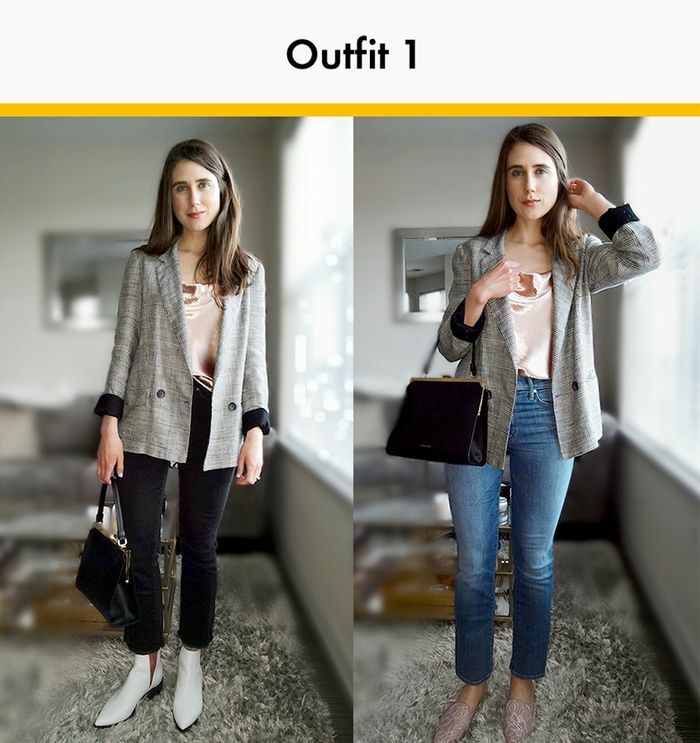 Upon downloading the app and plugging in the device, Alexa took me through a simple setup process, and the next step was to start trying on outfits and letting Echo Look capture them with its hands-free camera, which features its own lighting and background-blurring capabilities and also takes videos. I was intrigued to hear about all that the user-friendly device is capable of. Aside from having all of the same functions as the Echo (including telling you the weather and setting alarms), its most distinctive function is Style Check, which allows you to upload two looks and use its intelligence to help you choose the best one, based on characteristics such as fit, accessory choice, and color combinations. (It uses "machine learning algorithms with advice from fashion specialists.") You can even ask the community of Echo Look users for a second opinion. Other functions include the ability to share looks to social media and group your looks into specific collections (according to season, occasion, etc.). It's also worth noting that at this time, Echo Look is only available by request, but according to Amazon, the plan is to move to general availability this year, with a price tag of $199. Read on for the results of my seven days of outfit planning, assisted by Alexa. (Disclaimer: If it looks like I dressed for completely different seasons in one week, it's an understatement to say that the weather on the East Coast has been all over the place lately.) See the style feedback for yourself and shop the hero pieces that made it into both outfits on any given day, and read my thoughts about the device after actually using it for a week at the end. Heads up: The percentages below represent how strong Echo Look thinks the outfit is. The outfit with the higher percentage is its pick of the two. Thoughts: I was a bit surprised that it liked my white shoes over the pink ones, but I agree that they better complemented the colors of the checked blazer. Thoughts: These two outfits had a very different vibe, and I wasn't surprised that Alexa chose the more polished version by such a large margin. You can't go wrong with a trench coat. Thoughts: I believe that my accessory choices for the winning outfit are what caught the device's attention. They added interest to my top and jeans, unlike the black bag and boots in the other outfit. Thoughts: I was fond of both of these outfits, but I wasn't surprised that the printed top won over the all-black look (despite its fun accessory situation). Thoughts: I'm in complete agreement that a black leather moto jacket can do wonders when paired with most dresses. Case in point. Available in sizes O/S and XL. Thoughts: I wasn't expecting the winner to be the simpler combination of a tee and loafers, but I think that the denim blue and the metallic silver shoes paired with the busy pants threw it off a bit. I definitely get it. Thoughts: It clearly did not like my grandma-chic Easter outfit, but it did seem to love the way my blue jacket and shoes picked up the colors in the dress. The piece in common (the dress) is no longer available, but shop the jackets I wore below! So now that you know (and have seen) what Echo Look does, here's what I think of it. More often than not, I found myself agreeing with Echo Look's outfit picks and style advice, which I was somewhat surprised by. As you saw, every day for a week, I had it compare two different outfits that had a few pieces in common because when I'm choosing an outfit, that's how I do it. (Rarely will I throw out an entire outfit on any given day and start over.) Sometimes just an outerwear or shoe change makes all the difference. By day three, I realized that you could edit the photos (e.g., brightness and contrast), which I was happy to see, as the device's lighting was a bit unflattering at times. That was also around the time I started feeling a bit crazy for repeating "Alexa, take a photo" over and over until I got one that I was satisfied with. (But I feel like I did improve my posing skills in the process. #bloggerpose?) Another thing that the device helped me realize was when an outfit or piece was too unflattering to get even one good photo of (which I noted for future reference after swapping it out). That said, while it certainly was a very useful tool, by the end of the week, the device's outfit choices and reasoning became a bit predictable. I just wished the criteria that determined the strength of a look was slightly stronger and more specific, as oftentimes the percentages of the two outfits that were being compared were neck-and-neck (but I imagine that's something Amazon is working on during this trial period, so stay tuned). I'll admit to being generally quite impressed by Echo Look, as I'm confident that it's the most sophisticated, accurate, easy-to-use device of its kind on the market. In other news, I may never have to ask my husband how my outfit looks again (which he'll probably be okay with). I'll be sure to download updates to the Echo Look app as they're released, as Amazon is likely making regular updates prior to the official release and introducing more features. Stay tuned.